High Lifter, creators of the Outlaw signature mud tire, wanted to brand their Mud National and Mudtoberfest events in a truly unique way. While they had seen inflatable arches that incorporated tires before, they were always smooth, with the tread printed on the tire. 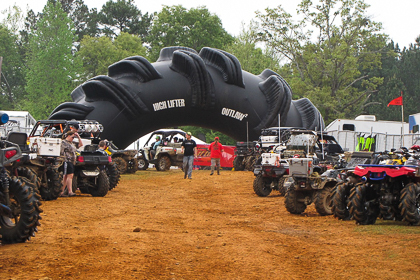 Event Coordinator Tracie Engi explained that High Lifter really wanted a tire with inflatable tread to play up the distinctiveness of their tire. The Outlaw tire came to life — complete with inflatable tread — in the shape of an archway that seriously causes a double take. Used as the entrance to their vendor area, this true-to-life inflatable arch gave High Lifter the attention they wanted. When the event is over, their arch deflates quickly for storage until the next round of mud-slinging fun. Think your inflatable project can't be done? We love a challenge: Send us your details!